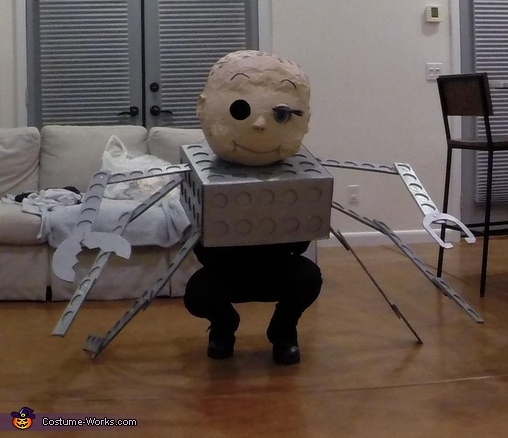 This homemade costume for adults entered our 2015 Halloween Costume Contest. I am wearing the costume and made it from scratch. I saw a Jack Skellington oversized head last year and it reminded me of the toy in Toy Story. I knew I could do a good representation of it. I used a beach ball to be the base for the paper mache head. I spray painted the head with flesh colored paint and painted on the dots. I painted the eye ball by hand and placed the painted eye underneath a bowl-shaped plastic piece. I took apart a paint brush and used it for the eye lashes and glue gunned them together. I cut a whole in the paper mache head for the missing eye. For the body, I took a cardboard box and cut it in half. I cut holes in half of the cardboard and glue gunned the hole cut pieces onto the other half of the box. For the arms, I used cardboard pieces as well and followed the same hole cutting and gluing technique. I spray painted all the cardboard pieces with a metallic spray paint. The arm pieces are attached together with captured fasteners to allow them to move. I then cut holes into the body and slid the arms in.